Local search engine optimization (SEO) is a crucial piece of your SEO plan. Google fields 3.5 billion searches each day, and thousands of these searches are for local businesses. If you haven’t started optimizing for local search, now is the time to start optimizing for it. You will drive more local leads to your business if you take local SEO ranking factors into consideration for your 2019 SEO plan. In this post, we’ll cover six local SEO ranking factors you’ll want to consider when optimizing for local SEO. When Google provides leads with information about local businesses, they want it to be accurate and up to date. If you want your business’s site to rank well in the search results, you must provide the correct information in your local listing. Having inaccurate information deters leads from interacting with your page. They want to visit business pages that have accurate information. You must keep your information up to date if you want to attract leads to your page. It is best to check your address and contact information. These are two key components of your Google My Business local listing. Your address is how you’ll drive leads to visit your business. Without the correct address, they won’t be able to find your business. It will also disrupt you from appearing in relevant local search results because the wrong address can cause you to appear for results that aren’t actually local to your business. For instance, if your address mistakenly said “Smithville, CA” instead of “Smithville, PA,” you wouldn’t drive local traffic from your actual location. By ensuring your local information is correct, you’ll appear in more relevant local search results. The proximity of your business will determine where your website appears in search results. 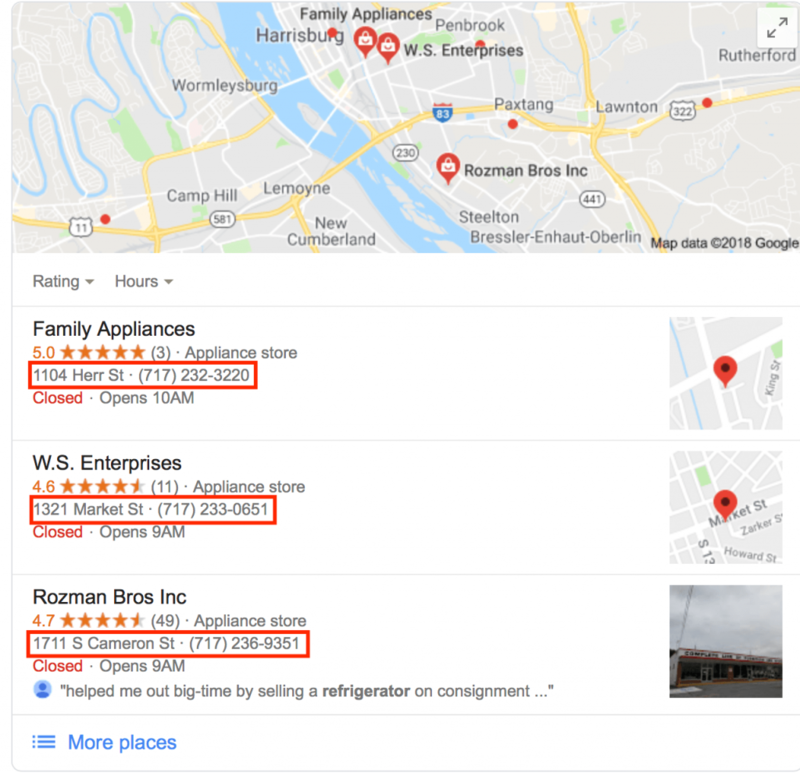 If your business is located in Harrisburg, PA, your business is going to appear in search results for people who search for businesses in that area. Proximity is one of the strongest determining factors when it comes to local search. Google wants to provide local searchers with businesses that aren’t too far away from them. You must take this into consideration when you’re optimizing your local profile. The best way to optimize your campaign is to integrate local keywords into your website. 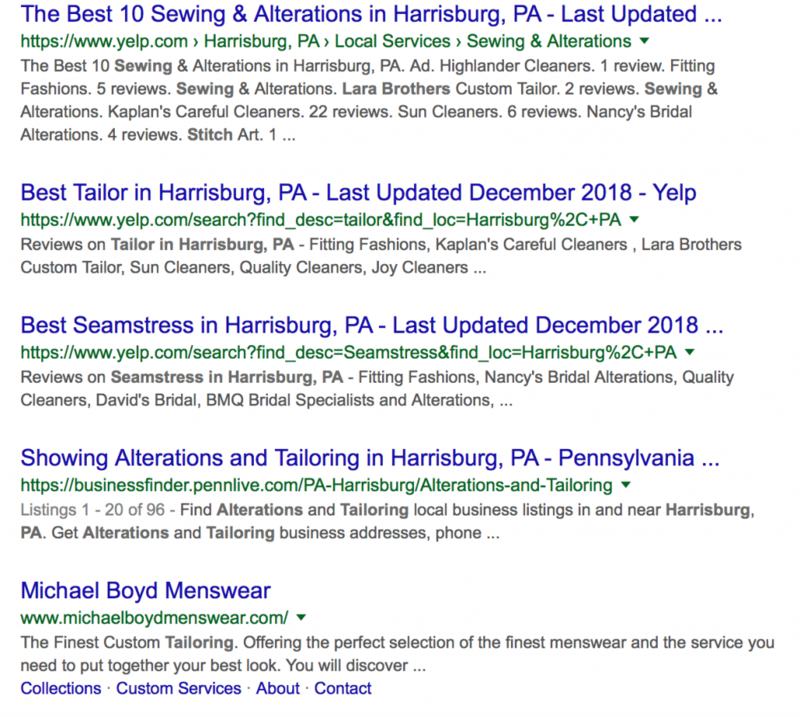 Keywords like “plumber in Harrisburg, PA” and “florist in Philadelphia, PA” are examples of local keywords that a local business would use on their site. By integrating these types of keywords, you’ll help your business appear in more local search results. Reviews play a fundamental role in your business’s success with driving local traffic to your page. Considering that 84 percent of people trust online reviews as much as they trust their friends, it’s crucial that you earn reviews that will drive customers to your business. If you want to earn more leads through local SEO, you must earn more reviews for your business. You want to earn many positive reviews, but they don’t always need to be five-star ratings. In fact, having all five-star ratings makes people suspicious that the reviews aren’t authentic. Likewise, having all low ratings will negatively impact your local SEO ranking. If you aren’t providing good products or services to your customers, it will show in the reviews. An abundance of negative reviews will lead fewer people to choose your business. So, how can you earn more reviews for your business? It can be a challenging process to earn reviews for your business. People forget to do them, which creates missed opportunities for you to earn new leads. You must stay on top of your buyers to get them to give an honest review of your products or services. You can send them a follow-up email after they receive their product or use your services. It’s an opportunity for you to invite them to leave their thoughts on your products or services. Sending reminder emails will get your audience on board with filling out reviews. 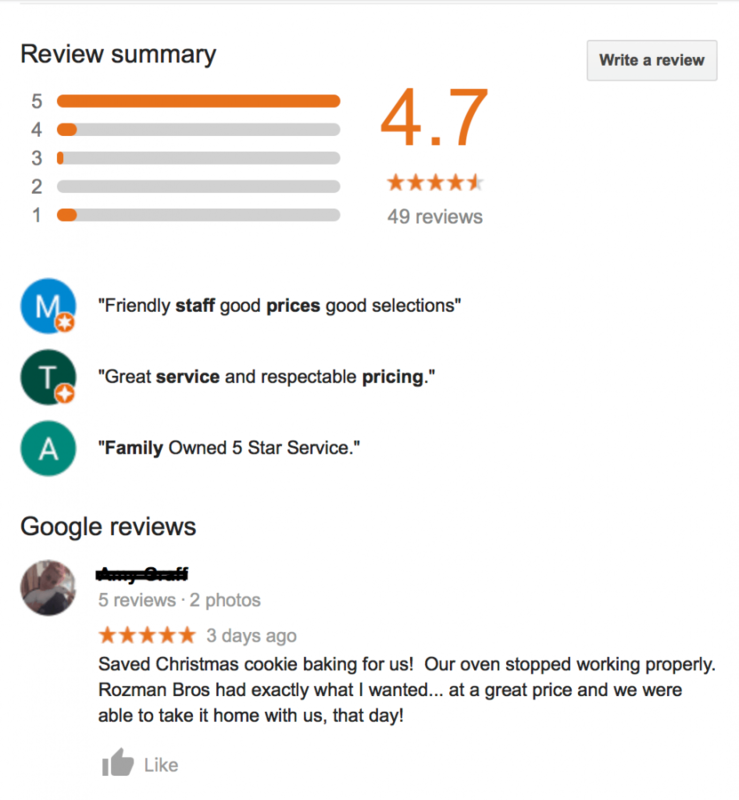 More positive reviews send a positive signal to Google. If people are enjoying their time with your business and leaving happy reviews, Google knows that your business is relevant to the query. It will bump your ranking up higher to help you reach more leads. This is a great tactic to help you obtain more leads that are interested in your local business. Mobile-friendliness is a vital part of your SEO strategy. With mobile searches rising in popularity, it’s more important than ever to optimize for mobile searches. Mobile-friendliness ensures that your site is configured to provide a positive mobile experience. Google gives priority to mobile-friendly sites. They know that people are conducting more mobile searches than ever, so they want to ensure they are getting directed to mobile-friendly websites. Responsive design is one important element to add to your site to make it more mobile-friendlier. A responsive design ensures that your website adapts to whatever device a user is using, whether it is a smartphone, tablet, or desktop. By incorporating a responsive design, you ensure that your audience experiences your site in the best format possible. This makes your site more user-friendly, which keeps leads engaged on your page longer. When they spend more time on your page, it increases your local SEO ranking and helps you reach more people. Keyword selection determines where you appear in the search results. When users conduct searches, keywords trigger them to appear in certain search results. If you want to appear in search results with leads that are interested in your business, you must choose the right keywords. To find relevant keywords for your local SEO listing, conduct keyword research. Keyword research will help you find relevant keywords for your local listing. You’ll generate a list of keywords you can integrate into your site. These keywords are specific, so they drive more relevant traffic to your page. You’ll get more local leads that are looking for your business. By choosing the right local keywords, you’ll help your business appear in more relevant search results. This helps you attract more interested leads and earn conversions for your business. Lastly, another ranking factor you’ll want to monitor is behavioral signals. These are actions your audience takes that indicates how they interact with your local listing. Behavioral signals help you understand where your local listing succeeds and falls short. There are many behavioral signals you can monitor. This includes your click-through rate (CTR), mobile clicks to call, check-ins, and more. These are all signals that your audience is interesting with your local listing and finds it relevant enough to check your business out. It’s a great opportunity to help you see where your business succeeds and falls short. If your CTR is low, you may need to optimize your listing to make it more appealing to your audience. This can be something as simple as altering the heading or meta description. By monitoring behavioral signals, you will help your local listing rank better in the search results and draw in new leads for your business. If you want to appear in relevant, local search results, you must optimize your SEO listing to rank for local searches. There are numerous factors that contribute to your site’s ranking. By optimizing for these factors, you’ll help your business reach more local leads. You’ll also be able to track everything relating to your SEO campaign with Google Analytics SEO dashboard. Ready to start optimizing for local SEO ranking factors? Contact us online or call us today at 888-601-5359 to speak with a strategist about creating a local SEO plan!